The world of SEO can be complicated. So this past year I wanted to simplify on-page SEO so that anyone with some WordPress knowledge can get things done. 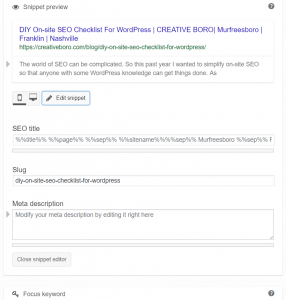 As a result, I developed an On-Page SEO checklist for businesses using WordPress. Ok, let's dive right in! If you are available in one city, then use that city in your keywords e.g. coffee shop nashville or nashville coffee shop. Go ahead and Google the keywords you want and make sure it is popular enough to be found in the drop down of suggestions. This drop down is a gold mine for those starting out. It will show you the most popular searches i.e. what you want to rank for in your town. Quick Google Lesson: In the Nashville coffee shop example you will see that in the Google drop down it will provide you with 'Nashville coffee shops'...shops plural. Do not use plural on your website unless you have multiple locations, and even then it may not read well. As of today, Google Search understands context of searches so you do not need to load your page with exact replicas of the exact keywords. Machine learning / artificial intelligence is now helping Google Search to read pages and understand what the page is 'saying.' There is nothing wrong with naturally using keywords, then providing content that supports them. Look at the related searches at the bottom of Google search results. These can also give you ideas and are things the public are actively searching. If you have a Google Adwords account, you can use their Keyword Planner Tool to search for keywords and see a range of volume per month. The more the volume, the higher the competition for SEO efforts. Step 1: have media on your page as appropriate. Pictures, embedded video, and infographics are great to help supplement your writing. Use original content as much as possible or give appropriate credit to stock media. In WordPress you have an 'Alt Text' field for each image. Place keywords here for each image. They do not need to be the same as it should be relevant to the image content. Only Google will read this info. It is not shown on the site. You can also use the caption and description fields to place in other info about the image. Think of caption as the title and description as well, your description. These are not required but can help when adding info about the image for the visitor. Do not forget to optimize your image size so that they load quickly and cache easily. Your page load speed should be excellent to avoid visitors from leaving before it even opens. Test Here: https://gtmetrix.com/. One Title with H1 tag is an easy way to get started. Utilize keywords, only if appropriate. All your main headings should have H2 tags. Subheadings will get your H3 tags. If there is more subheadings under your subheadings, you can use H4, and so on. Paragraphs and most non-heading content will be your p tag. 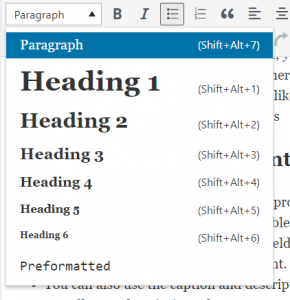 In WordPress, you will find all your tag options in the drop down of the text editor. Use your keywords in the url since it best describes your focus. People will look at your url, so make sure it describes what you will be talking about. Shorten urls by leaving out 'stop words' e.g. of, with, etc. No special characters e.g. =, %, ?, etc. No pop-ups. If necessary, then one that can easily be closed. Limit ads to sidebar or subtle in body with clear title of advertisement. Images do not stretch text into short lines. Sentences that do not run-on. Read everything out loud! It helps a lot. Vocabulary that average person can understand. Headers and lists like in this article make things easy to read. To help the visitor, include links to external sources like Google Webmaster Central Blog when it helps explain your content. For these external links, you should always check the 'Open link in a new tab' box so your website is still available when they are done elsewhere. Include links to internal resources when appropriate e.g. blog article that explains further detail on a topic or a SEO service page that provides exactly what the content is describing. Do not aim for a word count. Use enough content to fully explain and educate the reader. Opening paragraph should preview the page in some way. Use your keywords here. A series of articles or creating sub-pages may help with content that is stretching on for multiple pages. Email can be substituted for a form. Expect spam when placing your actual email address on the page. Phone should include area code (country code if applicable) and clickable for those on mobile. Include some sort of contact info i.e. directions, email, phone, address, contact form, etc. in the header or footer or both. Multiple locations can have a clear page that lists them all out with on-page SEO best practices. Edit the Title as you want. Slug is you're URL, so use the advise from above. Add a custom Meta Description so that it is more appealing when your page, product or article shows up in Google Search. Sell it but always ensure it describes what your focus is for that page. Misleading descriptions will hurt you. Ensure WP SEO Structured Data Schema (or similar) plugin is installed. All others to quickly share your page on their social networks. Buttons work well and you can see an example at the end of this article. Please do share it!